Morita was born in 1973 and now lives and works in Tokyo. He finished his MA in Fine Art at Goldsmiths, University of London in 2002. 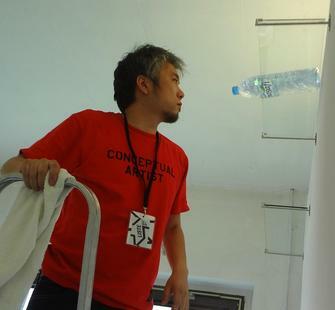 The concept driving Morita’s artworks is the mandate to pay attention to things generally left unnoticed, such as ordinary objects and phenomena in daily life, and to try to visualize humorously the elements which are intrinsically contained within them such as multilayered contexts and relationships. His recent exhibitions include: River Town (2015) at the Nihonbashi Institute of Contemporary Arts, Tokyo, Japan; Mono No Aware: The Beauty of Things (2013), at The State Hermitage Museum, St. Petersburg, Russia; and MOT Annual 2012 Making Situations, Editing Landscapes (2012), at the Museum of Contemporary Art Tokyo, in Tokyo, Japan. Read more at aoyamameguro.com.